Micellar Casein is derived from milk protein isolate using a natural cold-water microfiltration process that isolates and removes all whey protein peptides, leaving behind a clean, pure, and undenatured form of Micellar Casein that retains its bioactive properties. As a caseinate, the absorption rate of this material is naturally slower than that of whey, making Micellar Casein an ideal choice for overnight nutrition, providing 25g of time-sustained protein per serving to help support muscle building. Micellar Casein has a bland taste with a slightly chalky mouth feel, and mixes easily in a shake or smoothie. 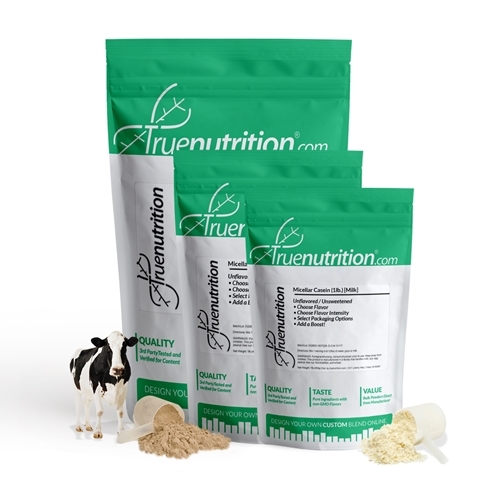 Uses: Sustained Nutrition: This slow-digesting protein is ideal for sustained time-release nutrition in overnight recovery formulas or for prolonged feelings of fullness and satiety in a meal replacement shake or smoothie! Mix-ability: Shake or stir rigorously in a shaker cup or blender. Taste: Mild, milky taste with a slightly chalky mouthfeel that goes great with most flavors! Mix 1 Serving (About 1 Scoop) in 8-12floz of water, juice, or milk. Micellar Casein (Milk), Lecithin (Sunflower). CONTAINS MILK. Although this product may not contain one or all of the following, this product is manufactured in a facility that handles milk, soy, egg, peanut, nut, tree, fish, crustaceans/shellfish, and wheat products. This is some of the best casein I've had and I've tried a lot. The chocolate is amazing and pumpkin spice is just ok. I am a basic b$tch when it comes to PS and the formula is just a little heavy on the clove. I always get a collagen boost and LOVE the formula! Great product. If you're looking for a slow release protein that mixes well in water (or milk) then get this product. Chocolate fudge flavor and Chocolate coconut bar flavor are both delicious. Love this stuff, great tasting and great solubility. It is velvety smooth and works well in any recipe. Give it a try!